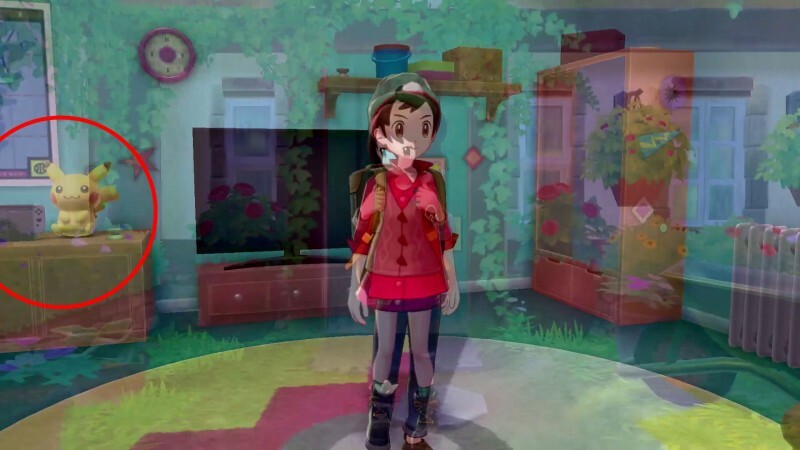 The Pokémon Company and Nintendo unveiled the Switch’s first true, all-new Pokémon RPG with Sword and Shield. 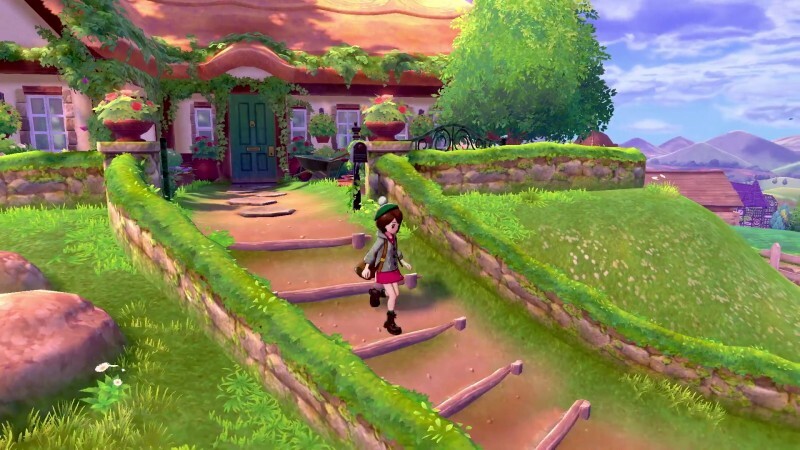 We learned about its starters, the new region, and a lot more, but there were lots of little hidden things in the footage, as well. Here are 15 things we noticed. 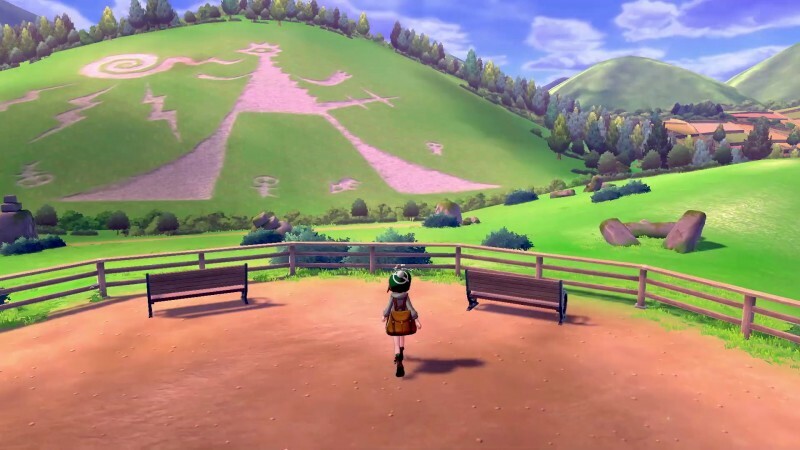 It’s safe to assume this is Sword and Shield’s starting area since it is the first area shown, but it also has a big road sign that says 01 in it. You can see birds flying in the sky, which are probably Fletchlings who call that area their home. There is also the Fletchling weather vane, and it looks like there are some nests on the chimney in the background. 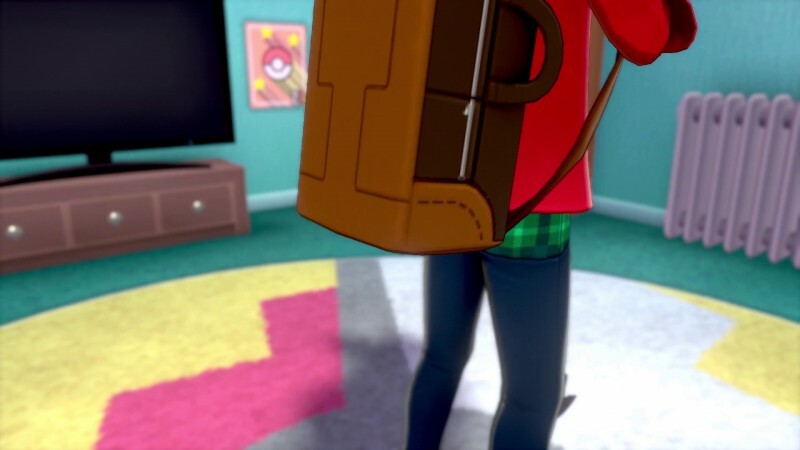 Trainers usually carry a small purse or messenger bag with them, but here the trainers have full-on backpacks. I doubt it will change gameplay dramatically, but it does make more sense considering the amount of stuff you are usually carrying by the end of the game. This has become standard practice for Pokémon over the years, but we’re happy to see it return. It’s there in a blink-and-you-will-miss-it cameo (hence the mediocre screenshot – apologies), but there is a Switch console in your bedroom. Historically, your trainer’s bedroom has always had the most recent Nintendo home console in their room. It looks like Sword and Shield is no exception. We’re not sure what that’s about, honestly. What are those weird rocks? Again, we’re not sure what it means, but it looks cool. 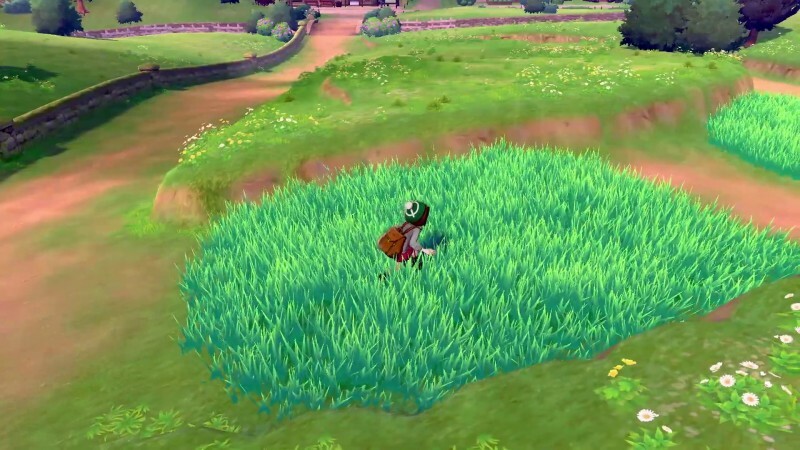 As near as we can tell, it looks like random battles make a return, which is disappointing considering seeing wild Pokémon grazing was one of our favorite new elements of Pokémon Let’s Go, Pikachu and Eevee. This is an obvious thing that is well highlighted in the trailer, but I wanted to include it just in case you missed it. It also looks like the camera is still out of your control and stays locked on an overhead position. There’s one right there. Hopefully you can ride it. Or steal from it. 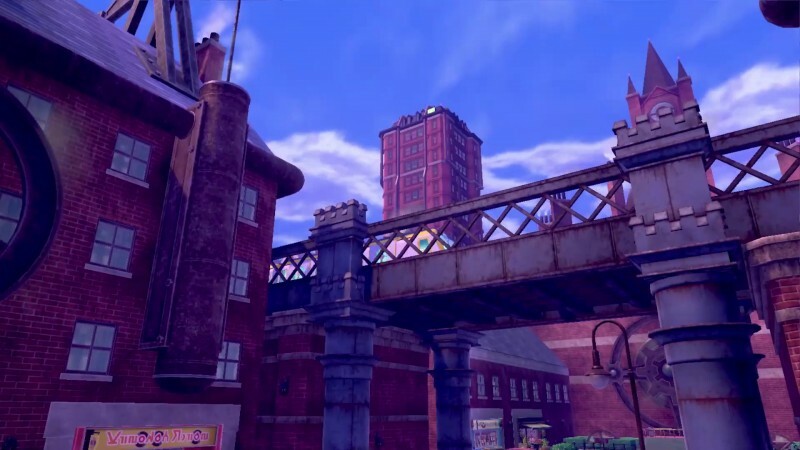 You can also see a handful of shops in the bottom of the picture, too. The three starters, Scorbunny, Sobble, and Grookey, all seem to have complementary abilities. In the footage we saw a Scorbunny set fire to some grass, a Sobble put out the fire, and a Grookey restore the grass. Maybe this is a hint at some kind of teamwork mechanic? 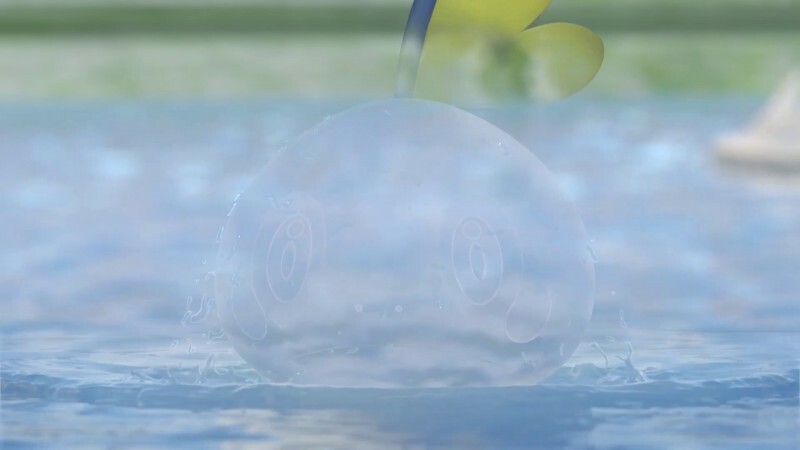 It also looks like Sobble can turn invisible? The trailer showed off the three new starters (which you just read about), but also confirmed a lot of returning Pokémon. Here’s everyone we saw. The footage of the game ends with a trainer wearing a glove (so it won’t mess it up their Poké Ball throwing hand, I guess) entering a huge professional arena. The logo on their shoulder is seen elsewhere in the footage, which hints at a new kind of sponsored league, perhaps? Along with the big arena, you can also see a number of smaller arenas, too. Those aren’t new to Pokémon, but you don’t often see them presented that way. 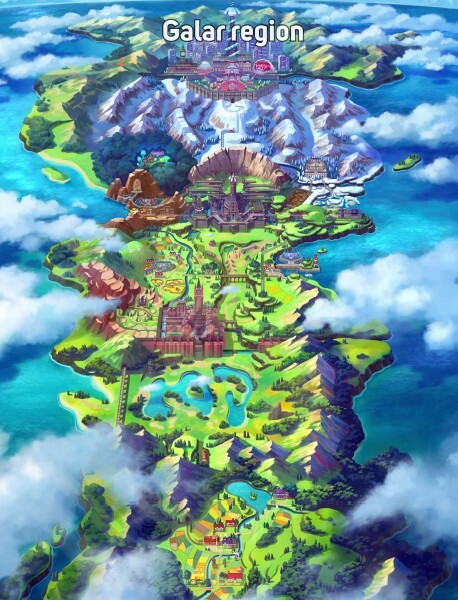 This is a pieced together shot of the Galar region from the footage. Speculation online points to it being based on Great Britain, which makes a lot of sense. The map also makes it seem like you will be heading north during the duration of the game, which is interesting. Arguably, the most interesting part, though, is if you consider the spire at the top the handle and the giant wall below it a hilt, the whole region kind of looks like a sword. It even kind of comes to a point at the bottom. There was more hidden in the trailer and additional footage, so let us know if you caught anything. For more on this morning’s reveal, head here and here.